The Odysseia: Skype, Whatsapp and Facebook: Here Today, Gone Tomorrow? Skype, Whatsapp and Facebook: Here Today, Gone Tomorrow? Phoning home from Saudi is becoming rather like this. Important but not easy. Last week Viber* was blocked. In the weeks ahead it will likely be Skype, Whatsapp and then quite possibly Facebook. 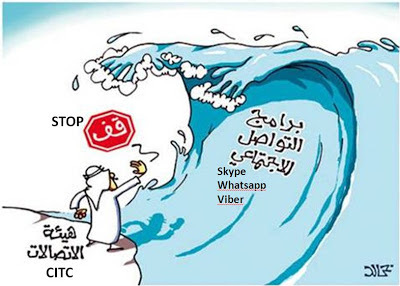 In March the Communications and Information Technology Commission (CITC) warned Viber and other encrypted services such as Skype and Whatsapp, that they would be blocked unless their operators granted the authorities surveillance rights. Viber* was the first to go because it allegedly failed to meet this demand. Saudi, however, has an interesting population demographic. 50% are under 25 and, on average, they each own 2 cell phones. Young people are not put off so easily. Almost the instant Viber disappeared, a plethora of YouTube clips appeared showing how best to circumvent the block. The Saudi news site, Sabq, said that Viber was back only days after it was suspended. As well as the authorities’ desire for political censorship and monitoring of all activities, there’s a second factor in their determination to regulate social media. Conventional calls and texts earn a lot for Saudi Telecom and the other competitors such as Mobily. There are 11 million expatriates living in Saudi and a correspondingly large number of Saudi students studying overseas. Web-based applications, which are easily downloadable and frequently free, are an increasingly popular way of keeping in touch. There’s a world of difference between calling my daughter in NZ using Saudi Telecom at 25 US cents a minute, and skyping her at 1.2 cents a minute. That’s a forty times more per minute cost difference. To put it another way, for the cost of one thirty minute call using Saudi Telecom, I can have one month’s unlimited calls to anyone back home in NZ using Skype. Given these rates, it’s not surprising that many callers are choosing low cost alternatives over Saudi Telecom and their competitors. Or that Saudi Telecom has always been one of the most profitable telecoms in the world. And then, there’s one final factor. I arrived in 2011, about the time of the Arab Spring. I remember the Day of Rage and being advised to stay indoors because no one was sure what kind of revolt might be staged. In fact very little happened, possibly because of the huge police and military presence on the streets, and the protestors’ fear of harsh government reprisals. It’s well known that cell phones and social networking tools like Facebook are a huge factor in fuelling discontent and social unrest. With Saudi’s high number of unemployed youth, this is a real concern for the government. The protest in 2011 was really a non-starter, but some might ask whether such protests could happen again, through the better organized use of social and personal media. Blocking Facebook and removing apps like Viber would be a strategy to prevent protests. We've been told that Skype and Whatsapp will be gone by Ramadan but with Ramadan already here and the apparent inability to block Viber we’re all left wondering. It seems to me a little bit like the story of the boy with his finger in the dike, while on the other side the raging storm waters get higher and higher. In the story his bravery saves his village and the flood waters subside, but as events unfold here I suspect the Saudi version of the story will have quite a different ending. *Viber is an app that provides free calls, texts and photo sharing. It has an excellent Arabic user interface, making it very popular across the Middle East.